The stress of getting home for the holidays is one thing, but getting back can be even more stressful. 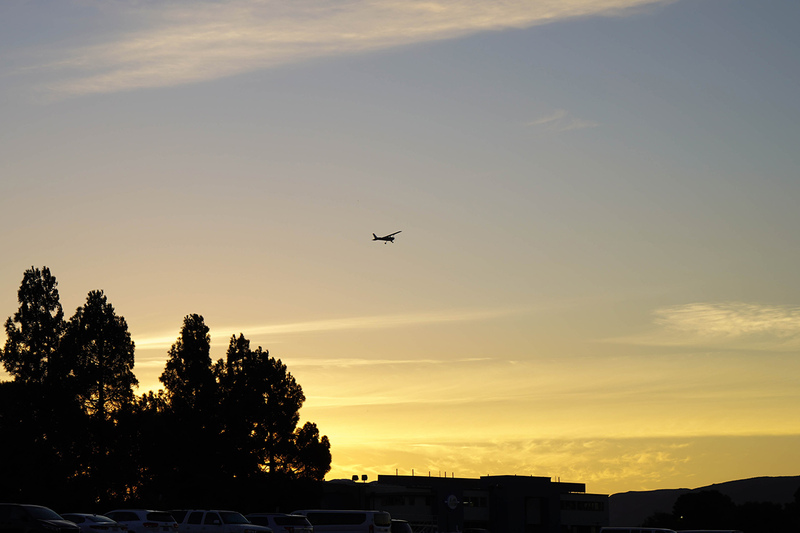 Cal Poly students and professors faced numerous flight delays and cancellations in their attempts to return to San Luis Obispo for the start of winter quarter due to winter storms. Callahan was in Philadelphia, Pennsylvania for winter break and was catching a flight back to San Luis Obispo with a layover in Phoenix. After arriving in Phoenix in the afternoon on Saturday, Jan. 5, Callahan met up with her friend, biomedical engineer sophomore Quinn Discerni, who is from Phoenix and headed into San Luis Obispo on the same flight. Their flight was delayed multiple times and eventually cancelled, but they found a flight into Santa Ana, California on Sun. Jan. 6. Because the age limit to rent a car is 21, Discerni’s mom flew out with them and rented a car to drive them up to Cal Poly. They arrived around 8 p.m. on Sunday. Discerni and Callahan are just two of the many students that were affected by flight delays and cancellations. 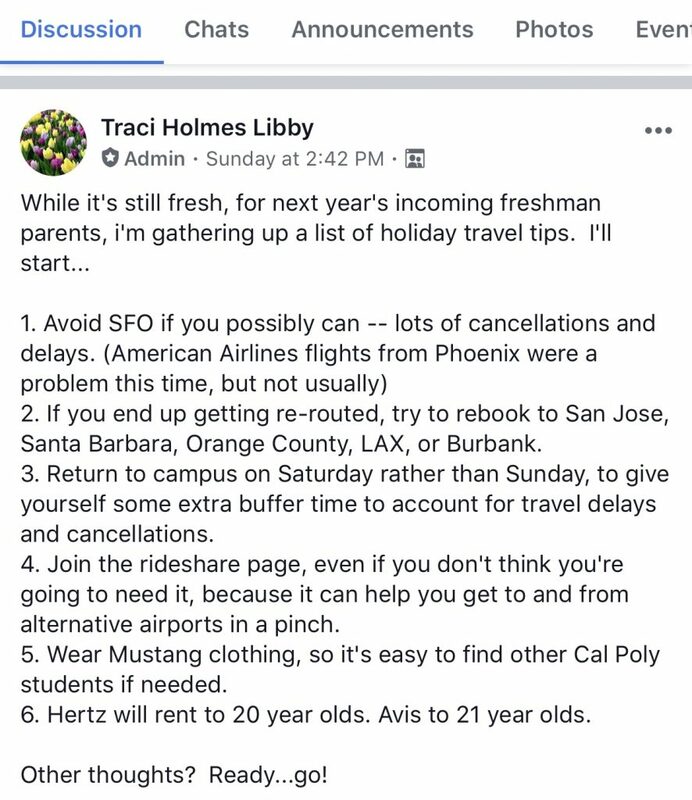 According to volunteer admin for Cal Poly SLO Mustang Parent Facebook page Traci Holmes Libby, the page was blowing up with comments about help with travel plans. According to the Facebook page, students with cancelled flights were able to find flights into the Los Angeles International Airport (LAX) and catch car rides up to San Luis Obispo via Rideshare or Amtrak. Others flew into San Francisco, San Jose, Santa Barbara, Bakersfield and Fresno with the hopes of finding a ride back to Cal Poly. Cal Poly parent Julie McCoy rented a 12-passenger van with her husband and drove stranded students from the San Francisco International Airport to San Luis Obispo. “We can do it, so why don’t we do it,” McCoy said. 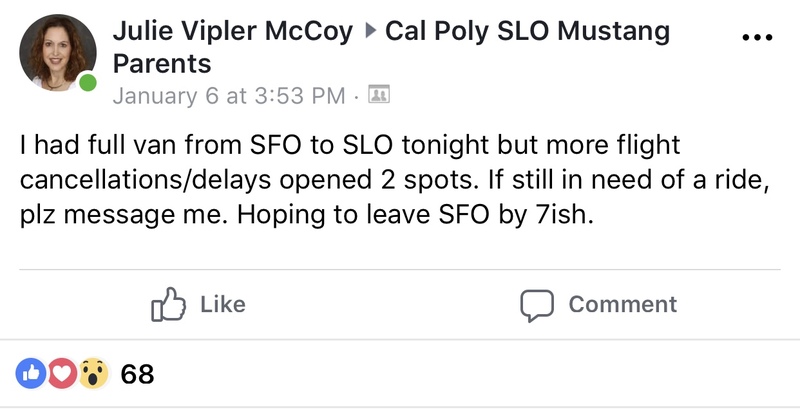 The flight cancellations not only affected Cal Poly students, but Cal Poly professors as well. Several professors cancelled the first day of classes because they were unable to get back in time. Libby created a list of traveling tips for the future to hopefully avoid some of these reoccurring issues.